I’m becoming increasingly convinced that the most important thing for a game to get right is the core mechanic. Last year’s Spider-Man wasn’t a deeply creative game, but web-swinging was so fun, I’d play it for hours. Similarly, my favorite roguelike I played last year was Dead Cells, which had a meticulously paced and interlocked system of unlockable weapons and powers. So believe me when I say that Hades lives and dies (and dies and dies and lives again) by its core mechanics. That’s not to say there aren’t a lot of other great parts to it! This is being designed by Supergiant Games after all. The graphical style, character design, the sound design (oh, we will be talking about the sound design), are all confidently presented and top notch. But it’s the core mechanics- the fighting, the unlocks, the trade-off between risk and reward- that has me seeing this game when I close my eyes. 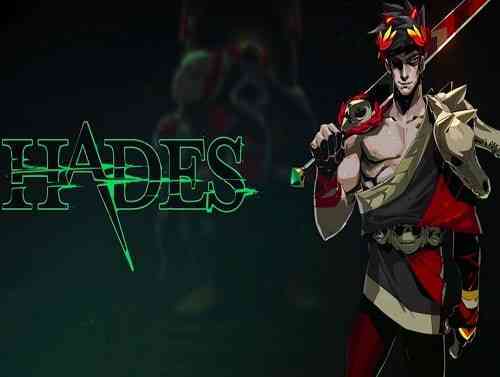 At its core, Hades is a roguelike dungeon crawler. With its top down camera angle, weapon combinations, and focus on timing, it also shares a lot of DNA with Supergiant’s debut title Bastion. An early meaty blob enemy charges up its attack before leaping towards you. At first, you’re gonna get walloped. But after you’ve studied its rhythms, you’ll be leading it into all sorts of devious traps, or know just when to overwhelm it with a flurry of blows. 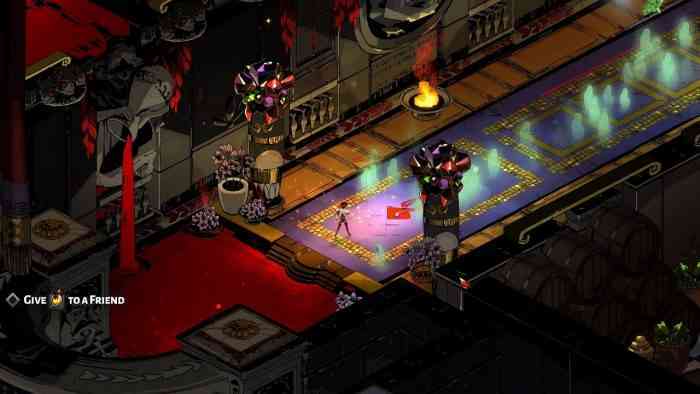 Every time you clear a room in Hades, you’ll have options of how to proceed, represented by doors with various icons on them. The game is in no rush to explain these icons to you; figuring them out is half the fun. Once you start to master their meanings, you’ll feel your brain expanding. Would you rather invest in a short term bonus or currency that you can use to strengthen your character when you inevitably die? What if that short term bonus combos well with your earlier power-up? That would have been enough for me. I’ve spent hundreds of hours playing Binding of Isaac and Slay the Spire, both of which boast similar approach to strategizing your “runs.” But there’s one area in which Hades leaves its family of games in the dust, and that’s story presentation. Hades as you may have guessed, is based in Greek mythology. As God of War and Assassin’s Creed: Odyssey have proven, gamers love their Olympians. In Hades, you are Zagreus, the scumbum prince of the underworld. Your dad wants you to stay in your room. Your uncles and cousins really want you to come chill with them on Mount Olympus. That’s the conceit of the entire game. Because you are already in the underworld, and because you can’t really die, “death” just resets you to Hades throne room. There you’ll be mocked by your dad, encouraged by the spirit of dead hero Achilles, annoyed by god of sleep Hypno, and pet your giant three-headed dog. At first, these conversations are pretty basic tutorial stuff, but each death adds additional dialogue opportunities and eventually, specific conditions unlock new conversations, rooms, characters, and more. My early playthrough was all about Cerberus becoming so agitated that he chewed up the whole living room. Hades was not happy. 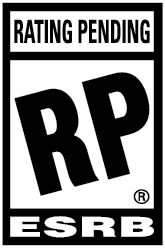 So besides the spot-on combat and unlock system, “dying” actually is an opportunity for fun RPG gameplay. Under the wrong circumstances, this could be a chore, but the dialogue in Hades in funny, sharply written, and wonderfully voice acted. Zagreus is a snotty teen, but his gentle sarcasm coxed a smile out of me. More than that, his death cries of frustration are kind of pathetic and deeply sympathetic. The tone of an actor’s voice is such a subtle thing, but the whole voice cast is stellar. I find myself wanting to bro out with Ares and not wanting to disappoint cool uncle Poseidon. This game is in early access! Early in early access too. It sounds like we are a year and a half away from an official launch. The Supergiant website promises “major content updates” including new “features, events, characters, weapons, powers, environments, and more.” I know some people have moral qualms about paying for a half-finished game, but Hades neatly walks the line between being self-contained and being “games as service.” There’s always the risk that some new feature or balance change shatters what makes me love the game- but I don’t think that’s gonna happen. More likely there will be more cool unlocks, story beats, character conversations… and maybe music tracks? I’m holding out hope for a new Korb/Barrett collaboration. That would be reason enough to grind my way to the game’s closing credits. As it stands now, I’m working hard to grind enough darkness and keys to unlock the currently existing content but I can see the gaps. There are a number of spots for weapons that haven’t been filled yet. And there are only two bosses in the game thus far… but I haven’t even been able to beat the first one yet. I’ve come close, but Hades is wicked hard. I can see the countdown for new content though, and that has me stoked. What is it gonna be? A new level? A weapon to master that might help me progress farther? New story scenes? New gods and skill trees? Something I haven’t even considered yet? Hades is a fun game in its base state- and frankly, being early access only contributes to its promise right now.